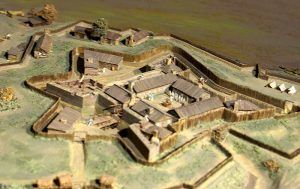 Fort Duquesne was established by the French in 1754, at the junction where the Allegheny and Monongahela Rivers come together to form the Ohio River, in what is now downtown Pittsburgh, Pennsylvania. This confluence of rivers had long been seen as an important point for controlling Ohio Country for both settlement and trade. During the late 1740s, William Trent, an Englishman engaged in the fur trade with Ohio Country Indians, built a trading post at the headwaters of the Ohio River, where he and other English traders quickly prospered. Both the French and the British were keen to gain an advantage in the area; however, the French claimed it as theirs. In the meantime, the British colonies to the east often granted land indefinitely to the west, setting the scene for conflict. In the early 1750s, the French attempted to deny England access to the Ohio Country. 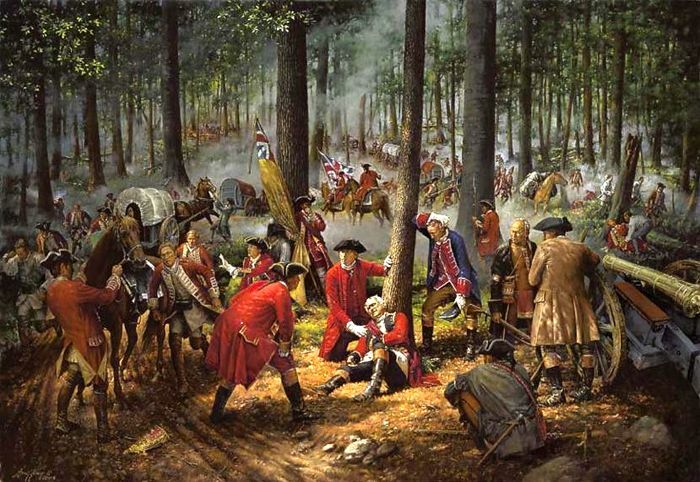 On April 17, 1754, a French military force arrived at the Forks to find a small and undersupplied contingent of Virginia militiamen and laborers hastily trying to complete their own defensive works. Capturing William Trent’s outpost and chasing the men off, the French began to construct Fort Duquesne. It was named for Ange de Menneville, Marquis de Duquesne, the Governor-General of New France from 1752 to 1755. The more impressive structure was intended to proclaim their possession of the Ohio Country to the British and local Indians. 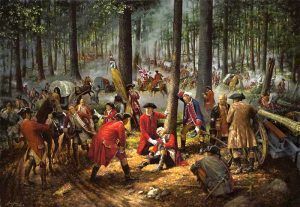 The French also captured several other English settlements in western Pennsylvania, which would eventually lead to the French and Indian War (1756-1763). 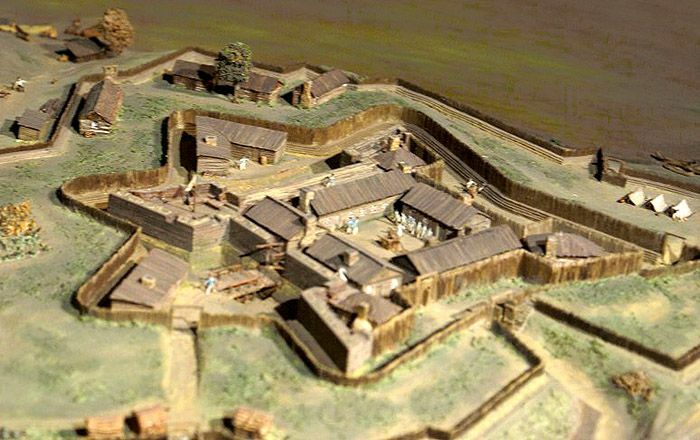 The French also began building a line of forts, including Fort Presque Isle on Lake Erie near present-day Erie, Pennsylvania, followed by Fort Le Boeuf, about 15 miles inland near present-day Waterford, and Fort Machault, on the Allegheny River in present-day Franklin, Pennsylvania. Two British expeditions, the first led by George Washington in the summer of 1754 and the second by Edward Braddock a year later, failed to dislodge the French from this site. 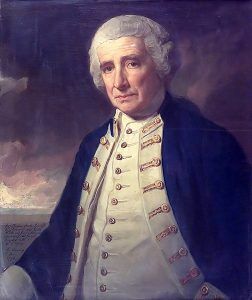 Washington was with General Braddock in his second expedition. Braddock’s forces were part of a larger British plan to attack multiple French forts throughout North America simultaneously. Braddock’s troops tried to move quickly through the mountains to attack Fort Duquesne using the road Washington had built earlier; but, the roadbed was too narrow for the heavy armament and the roughly 2,400 men. To increase his speed, Braddock made the fatal mistake of splitting up his troops. As Braddock and the first of his troops approached Fort Duquesne, the French and allied Indians attacked. Braddock and more than half of the 1,200 British men with him died. The remaining soldiers retreated and British troops buried the general near Fort Necessity, concealing the grave within the roadbed by marching over it to prevent desecration of the general’s body. Braddock’s final resting place lay hidden until 1804 when workmen discovered a body reported to be the general’s. A monument constructed in 1913 marks the site over the re-interred bones of General Braddock. For the following three years, Fort Duquesne served as a base of operations for French-sponsored Indian attacks on the Pennsylvania and Virginia frontiers as the British struggled to recapture their former possessions. Finally, in 1758, they were victorious. On September 14, 1758, the British attacked the post as part of a large-scale British expedition with 6,000 troops led by Brigadier General John Forbes to drive the French out of the contested Ohio Country and clear the way for an invasion of Canada. Forbes ordered Major James Grant of the 1st Highland Regiment to reconnoiter the area with 850 men and when Grant proceeded with the attack, his force was out-maneuvered, surrounded, and largely destroyed by the French and their native allies led by François-Marie Le Marchand de Lignery. Major Grant was taken prisoner and the British survivors retreated fitfully to Fort Ligonier, Pennsylvania. However, after repulsing Grant’s advance party, many of their native allies deserted and the French knew they were vastly outnumbered by General John Forbes and his troops, who would be arriving soon. On November 23rd, the French commander of Fort Duquesne blew up the post and retreated northward to Fort Machault. The advancing British heard the explosion ten miles away. General Forbes and his troops were deprived of their prize, but, had gained the strategic ground. Upon their arrival, they immediately set to work building another fortification, which they called Fort Pitt in honor of William Pitt, the English Prime Minister. Fort Pitt remained under British control until the American Revolution, when the colonists took possession of it. It later served as an important trading post with the Ohio Country Indians and settlers. When more emigrants pushed into the area and the Indians began to attack, the fort’s garrison actively protected people moving into the region. 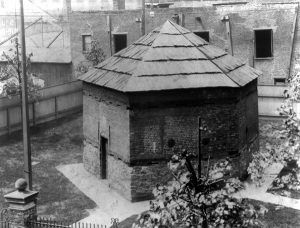 Though the fort is gone today, its foundations can still be seen at Point State Park in downtown Pittsburgh, Pennsylvania. The park includes a brick outline of the fort’s walls. The park also features the Fort Pitt Museum, which focuses on the French and Indian War as well as the frontier period of local history. Also on the property is the Fort Pitt Blockhouse, built by Colonel Henry Bouquet in 1764. It is the oldest architectural landmark in Western Pennsylvania.